Preheat oven to 325º F. Heat sugar in a saucepan, stirring frequently, until melted and golden. 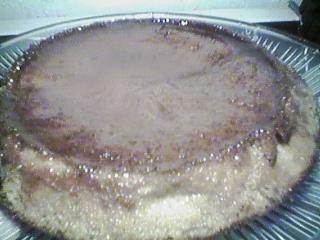 Quickly pour caramelized sugar into pie tin or flan mold, tilting pan quickly to cover bottom. Beat milk, eggs, yolks, and flavorings together until combined. Bake at 325º F until set, about 50 minutes. (Larger dishes may take longer to bake.) Cool before serving. To serve, unmold and cut into wedges.